Thanks for stopping by on the Blog Hop. In case you missed it, here is my giveaway. Just leave a comment on here and I will randomly select a name. Make sure you leave a way for me to contact you in case you win. The postcards I showed you yesterday have been sent. So hopefully they will arrive on time. Here's something else I have been working on. I'm trying to help finish this for one of the ladies in our local Guild. She has been undergoing treatment for cancer and has been unable to finish up some of her UFOs. The quilt is a memorial to her brother who was an avid supporter of fishing's "Catch and Release" program. She had used trapunto to give the fish more dimension and definition. She also added trapunto to the log sticking out of the water. I know that it is a bit hard to see that...maybe this close up illustrates it a bit better. 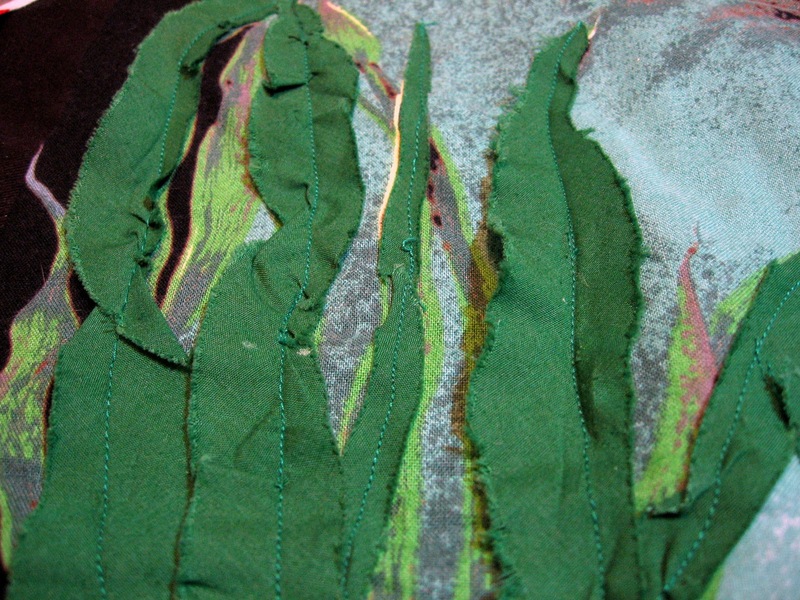 She also used a loose raw edge applique technique to represent the water grasses. 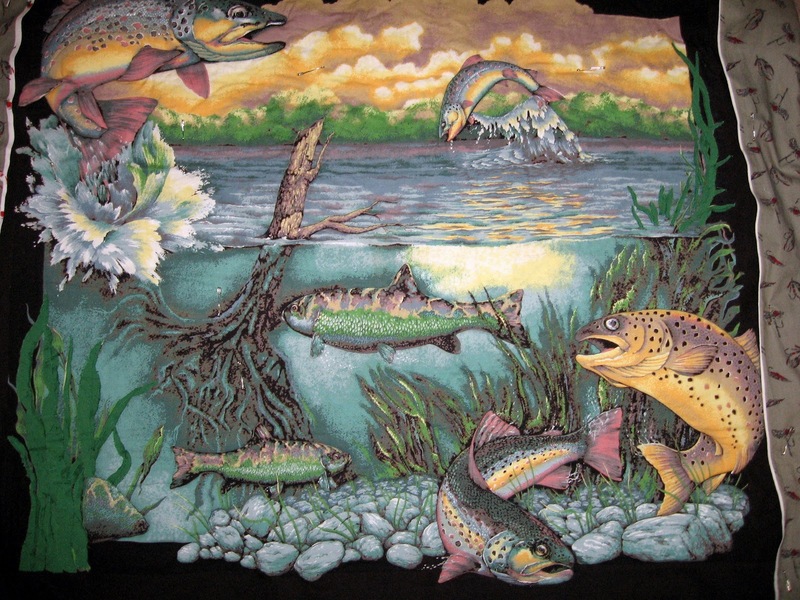 Now I'm attempting to do some additional FMQ to accent a few of the highlights like the sprays of water, the shimmering reflections on the water and the sunny clouds in the background. 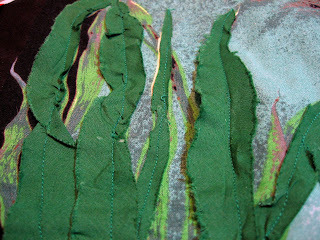 I ran into a bit of FMQ difficulty and ended up with a bunch of "thread nests" on the back of the piece. Hmmm....checked the bobbin thread...checked the top thread tension...still can't figure out where I'm going wrong. Any tips? Leave one in the form of a comment and you have a chance at winning the Blog Hop giveaway that I mentioned in yesterday's post. In the meantime, visit some of the other blogs that are at the party! Just click the link at the side bar to take you to a listing of attendees. What a great friend you are to help your "sister". When all else fails with my FMQing, I take the bobbin out and put it back in again, remove the thread and put it back in again, change my needle, and pray. Merry Christmas. well I would tell you to play around with the "Fadenzug" if I knew what the word for it is in English. I would probably describe it as the thingy with which you change the tension of the thread - how easy it comes off the bobbin. I'm sorry but I am still lacking in "sewing machine vocabulary" but I hope you get the gist. Let's hope your machine has a wheely thingy to change the tension. Do you pull your bottom thread through to the top when you start sewing? And pull your top thread out of the way? Sometimes it's just the thread and another color or type won't knot as much. I like the pray suggestion too. You'd think doing service would make it turn out better but sometimes because I know someone else's eyes are going to be looking at it, everything turns out worst. Sorry, but don't get discouraged, you're helping. Does the needle need changing?? What a beautiful piece, my brothers would love this! When I am doing thread painting or accents, I use a bobbin thread instead of the regular sewing thread that I use on the top. Bottom line by superior is my favorite. 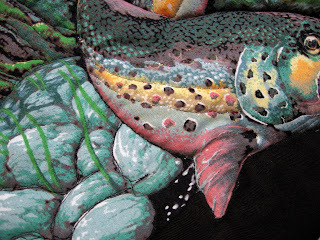 Sorry I can't help you with your problem but I have to say that I love the salmon! I wish I could tell you what the problem is, but I struggle with that myself. Usually if I rethread my machine it fixes the problem, but I don't know why.